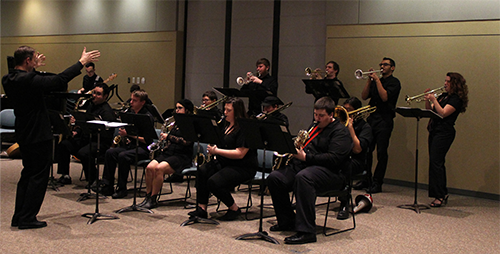 Josh Fleig, director of instrumental music at Cowley College, and Chris VanGilder, Arkansas City High School band director, had their jazz bands collaborate for an evening of music Tuesday night inside Cowley College’s Earle N. Wright Community Room. Nearly 200 people attended the joint concert. This marks the second Ark City High School and Cowley College collaboration in recent years. In February, 2012, the ACHS Concert Band and the Cowley College Concert Band performed a joint concert in the Robert Brown Theatre.